Founded in 1992, Venstar Inc. is a leading thermostat and energy management system (EMS) designer, manufacturer and supplier. Venstar is known for providing value to its customers via ease of use and installation, proven cost savings, improved energy efficiency, quality and reliability. Venstar is one of the largest thermostat suppliers in the world abd designs and produces Venstar-branded products as well as thermostat products for the biggest names in HVAC. Venstar’s Surveyor is a leading energy management system, typically saving small-box retailers 25-35% of their energy usage which translates to tens of millions of dollars in energy cost savings. Venstar’s Surveyor EMS empowers small-box retailers and other multi-location businesses to remotely monitor, control and manage their HVAC and lighting/electrical and mechanical systems at all their stores using a desktop computer, laptop or mobile device, giving them unprecedented visibility into their energy usage. Designed specifically for small-box retail chains with hundreds to thousands of locations, Surveyor provides powerful energy management tools for energy and facility managers responsible for managing multi-location companies. Venstar’s Surveyor LCP500 Load Control Panel controls up to 10 independent lighting zones and allows a variety of control methods, including event driven, time scheduled, manual operation and Internet control. Users can choose one or a combination of the control methods to include multiple accessories that can be used to control the same lighting zone and allows for up to a two-hour override per zone. The LCP500 also supports daylight harvesting to significantly reduce energy costs and complies with California Title 24’s requirements. The built-in lighting control system and networked sensors identify the levels of outside light coming in through windows and automatically adjust interior lights. Daylight harvesting delivers a significant decrease in the lighting needed, which greatly reduces energy costs. Small-box retail chains can expect to see significant savings when they incorporate daylight harvesting into their energy management plans. 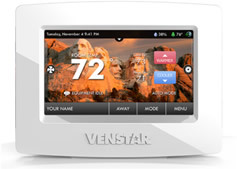 Venstar offers three commercial models of its affordable, fully featured programmable Voyager thermostat. Designed for ease of use, Voyager thermostats feature large, easy-to-read displays with easy setup and controls. Voyager thermostats feature “Simple as You Want” operation with a choice of programming options. Select models also include the ability to control or monitor a second temperature sensor, control humidification/dehumidification and include Energy Watch functionality. Voyager thermostats deliver a rich feature set that enables users to reduce energy costs with local or remote operation via the “Internet of Things” Wi-Fi, ZigBee and Z-Wave. Select models offer Wi-Fi inside for remote monitoring and control using Venstar’s free Skyport mobile app. Voyager thermostats are compatible with virtually every type of commercial heating and air conditioning system.